Abdul Sattar Edhi, NI (Urdu: عبد الستار ایدھی, Gujarati: અબ્દુલ સત્તાર ઇદી), or Edhi, as he is often known, is a Pakistani philanthropist. He is head of the Edhi Foundation, the world largest ambulance help service and charity. 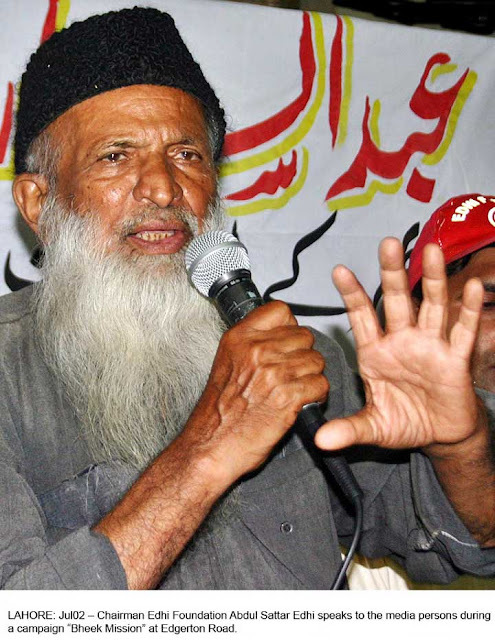 Together with his wife, Bilquis Edhi, he received 1986 Ramon Magsaysay Award for Public Service. He is also the recipient of the Lenin Peace Prize and the Balzan Prize. Edhi is of the Memon, Muslim community. On September 22, 2010 Edhi was awarded honorary degree of Doctorate by University of Bedfordshire. Honorary Doctorate degree from the Institute of Business Administration Karachi (2006). ISLAMABAD: Prime Minster Yousuf Raza Gilani has nominated philanthropist Abdul Sattar Edhi for the prestigious Nobel Peace Prize for his outstanding services, Express 24/7 reported on Monday. During a meeting with the United Nations Special Envoy, Dr Nafis Sadiq in Islamabad Gilani made this official announcement. Edhi is head of the Edhi Foundation, the world’s largest ambulance help service and charity. The Edhi Foundation provides free shelter to old people, orphans abused women, even injured animals. Its services also include rehabilitation of drug addicts and mentally challenged people. The foundation operates hospitals, mobile dispensaries, free kitchens, helicopters, airplanes and hundreds of ‘little white’ ambulances. Ambulance dispatchers field 6,000 calls a day from Karachi alone, boasting a 10-minute response time. The foundation has also done relief work in other parts of the world like Africa and the Middle East. He owns a single set of clothing and often sleeps in a storage room – even though millions of dollars pass through his hands annually. At 83, creature comforts don’t matter much to Abdul Sattar Edhi. He is far too busy caring for the sick, feeding the hungry and burying the dead. Known to some as Pakistan’s Mother Teresa, Edhi is a humanitarian light in a violent and troubled land. With the vast majority struggling in a daily moribund economy, natural disasters, poverty, political instability, corruption, militant attacks, and political enforcers are facts of life. “In this environment, a shrinking violet won’t make much headway,” he says. “You’ve got to be tough. Gruff and confident.” Edhi refers to himself as beggar, and wears his worn black tunic as a badge of honour. His charity does not discriminate based on religion, race or gender. For him, religion is human rights. As for the rich, even as he welcomes their donations, he chides them for their priorities and their motives. Edhi often sleeps in the cluttered storeroom at his office, relegated there by his wife, Bilquis, a nurse who is also a key charity figure. For decades, Edhi’s popularity among Pakistan’s 170 million people allowed his ambulances to brave riots, gunfights and ethnic battles. Thieves, political goons and even the Taliban offered contributions and free passage.